This style of uniform would have been worn by officers in the Kerry Militia from 1868 to 1881. There are eleven items of this uniform in the collection. Together these comprise: a mess dress uniform; a full dress uniform; and a levee dress uniform. One of the items, the full dress tunic, has a name stitched inside: R.E. Palmer. Palmer became an officer in the Kerry Militia in 1874. 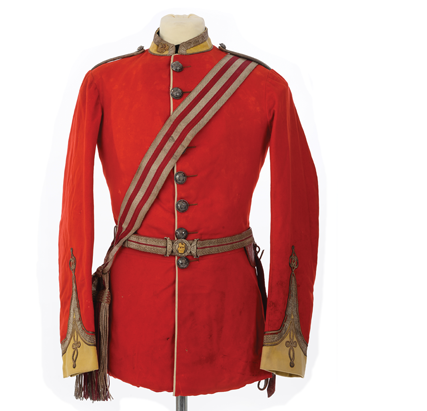 This uniform was donated not by an individual but by another Museum, the Horsham Museum in the UK. It had come in to their Museum after it was discovered in an attic, and once they had pieced together the connection to Kerry they offered to send it back to Tralee, which we gladly accepted.